Lacing the world with hard-hitting bangers that maintain the head-nodding traditions of that raw East Coast boom bap, Toronto’s Marco Polo is back with another classic release through Duck Down Music. 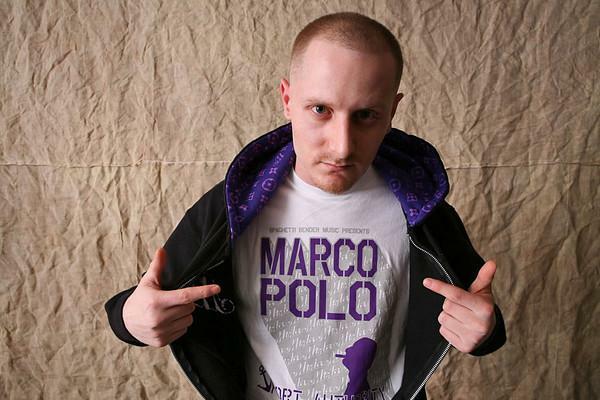 Since dropping Pumpkinhead’s Orange Moon Over Brooklyn in 2003 on Soulspazm Records — Marco’s first full-length production — until his latest 2010 Duck Down release with fire spitter Ruste Juxx, “The eXXecution” Marco Polo has collected a catalog of records that would make any new jack producer second guess his career path. Blessing MP’s production on The Stupendous Adventures of Marco Polo are rhyming heavyweights like Large Professor, Skoob of Das EFX, Grand Daddy IU, Royce da 5’9,” Elzhi, Torae, Skyzoo, Ruste Juxx, and Diamond District. The album also features MC’s like Red Clay, Shylow, Saga, Promise, Surreal, D-Story, Bad Seed and Arcee. And what’s the meaning of the interesting album title? “The Stupendous Adventures of Marco Polo was a title Shylow came up with as a joke but I loved it and instantly wanted to rock it as the title for this project. It’s sh*t loads of fun to say and my pops use to say “Stupendous” all the time growing up so I thought it fit perfectly. My pops says a lot of crazy sh*t!” jokes Marco. He may be a funny dude with a classic sense of humor, but you better believe that what is blasting out of his tattered MPC2000XL in his Brooklyn lab is nothing to laugh at.